Dated 1869, used canvas and oil. Size – 59 by 80 cm. Located in the Pushkin Museum of Fine Arts, Moscow, Russia. 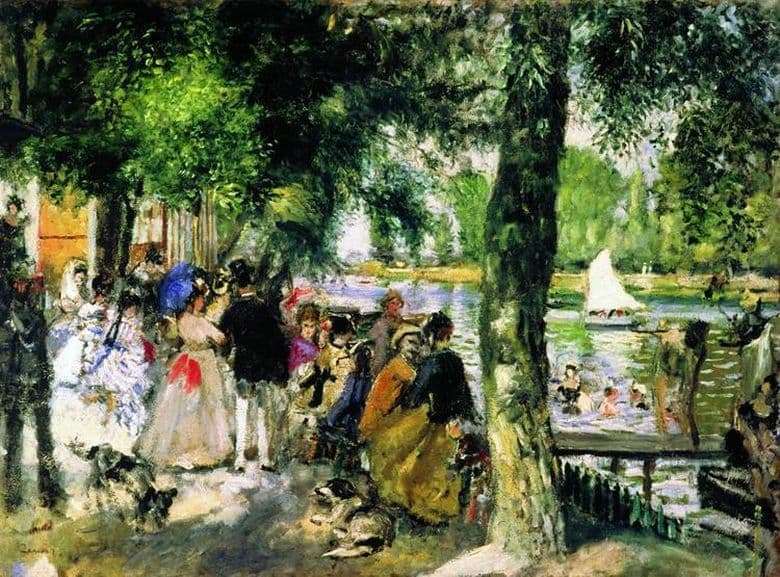 Renoir during his life tried several styles of painting, but is widely known as one of the outstanding French impressionists. He is distinguished by the predominance of exquisite and romantic images in portraits. This canvas master wrote from life almost simultaneously with K. Monet. Once, an incredibly scandalous, and now generally accepted “Breakfast on the Grass” by E. Manet, created six years before them, was also inspired by this place. Artists, like many Parisians of their time, came to the coastal pontoon cafe in the summer or, according to another version, went for walks to the quiet suburb of Paris on the shady island of Croissy, where the bathhouse officially allowed by the mayor’s office and dressing rooms were installed. At the same time, the other name of the picture “The Frogger” also has two interpretations: they called the frogs who decided to swim in the shallow waters of the Seine, as well as girls of easy virtue in defiantly bright, and sometimes frankly screaming dresses that rushed ashore in search of clients. In the landscape, great accents are given to the expressive warm colors, the riot of summer greens, water highlights and many details of the magnificent dresses of the XIX century. with crinolines, bows, ribbons, sun umbrellas, caps and cylinders. The foliage of the trees, traced in short strokes in a rich range of shades, as if moving and rustling under the frying wind, fluttering and light skirts of the ladies, the patterns of light and shade quickly change on the walkway and tree bark, the second black and white dog crouches… All these important little things that carry the viewer into the summer, managed to convey to the author, who was still only at the beginning of his impressive creative path.